So You Have to Write a Paper: Research Coach: Just tell us what you need - finding sources like books, articles or websites, choosing a topic... This session will provide general research assistance that is geared toward exactly what you need when you need it. Citation Frustration: One of the most time consuming and often confusing parts of the research process is properly citing sources. Let us help you make citation less annoying. This session will share formatting tips and use of tools that help to create citations, determine source type, and format bibliographies. This session will save you a ton of time! The “Find Articles” Assignment: You need to find articles for your assignment. How do you even do that? 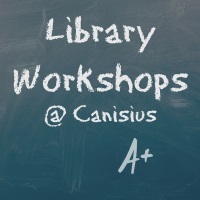 This session will help you select appropriate databases, identify various types of articles and find the resources you need for your specific assignment - in record time!